December 18, 2012-- MOUNTAIN VIEW, CA and WASHINGTON, DC -� While thousands of miles may keep them apart, military personnel and their families don't have to be alone this holiday season.� Blue Jeans Network,�Military Association Benefits Group, Military Comm Networks and its affiliated Joint Force Group companies, have partnered to create Home for the Holidays.� Home for the Holidays is a program that provides free video conferencing services to U.S. soldiers and their families. Home for the Holidays (http://bluejeans.com/for/home-for-holidays-2012) runs from December 20, 2012 to January 2, 2013.� The service is completely free to servicemen and women to connect with their family members.� A key component of the Home for the Holidays program is that it simply doesn't matter what kind of end point device is in the hands of soldiers and their families.� Blue Jeans Network is providing the video conferencing service - a simple, scalable, multi-party video conferencing service that works with a wide array of devices, including Skype, Google Video Chat, telepresence systems and even Web browsers. "We tried to roll out this program last holiday season but ran up against interoperability and scalability challenges," according to Dennis Butts, CEO of Military Association Benefits Group.� "With Blue Jeans on board, having soldiers and family members spread across Google, Skype, and a host of room-based systems used by the military is simply not an issue.� Blue Jeans makes the connections easy and reliable." "There are over one million servicemen and women who are away from their friends and family over the holiday season," added Krish Ramakrishnan, CEO of Blue Jeans Network.� "Whether serving overseas, or stationed at one of hundreds of bases in the United States, there shouldn't be any impediment to these families seeing each other over the holidays." 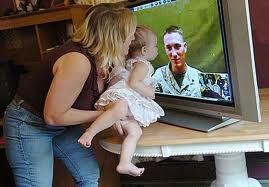 Beginning immediately, families and servicemen are able to start scheduling video conference calls to take place between December 20, 2012 and January 2, 2013.� Reservations are scheduled via the Military Association Benefits Group (MABGI) at [email protected]�or call 715-395-7076. \"We tried to roll out this program last holiday season but ran up against interoperability and scalability challenges,\" according to Dennis Butts, CEO of Military Association Benefits Group.� \"With Blue Jeans on board, having soldiers and family members spread across Google, Skype, and a host of room-based systems used by the military is simply not an issue.� Blue Jeans makes the connections easy and reliable.\"
\"There are over one million servicemen and women who are away from their friends and family over the holiday season,\" added Krish Ramakrishnan, CEO of Blue Jeans Network.� \"Whether serving overseas, or stationed at one of hundreds of bases in the United States, there shouldn't be any impediment to these families seeing each other over the holidays.\"